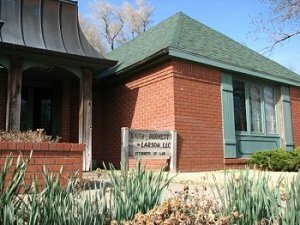 Smith, Burnett & Hagerman, LLC, located in Larned, Kansas, is the proud heir of a rich tradition of serving legal needs of pioneers, business and farm organizations in west Central Kansas. The law firm's Larned offices are among the best in town. The building was custom built in 1970, and the firm has been at this location since that time. Larned is part of Pawnee County, and literally is located on the old Santa Fe Trail at the fabled "Pawnee Fork." The Santa Fe Trail Center is located just west of town. Old Fort Larned is six miles west of town and the finest preserved frontier cavalry fort in the National Park System. The Indian wars of 1868 that culminated in Custer's defeat at Little Big Horn eight years later began just west of Fort Larned. Larned's largest employer is Larned State Hospital where a host of mental health treatment and incarceration problems arise each year. Our senior partner, Don Burnett, helped enact and draft many of the probate laws affecting entry into the mental health system in Kansas. Glee Smith Jr., as senator, and then President pro tem of the Kansas Senate from 1957 to 1973, helped enact many of the laws of our state, most especially the 1964 civil procedure code and the codification of the 1969 criminal code. Glee Smith began practicing in 1947, Don Burnett in 1958, Jerry Larson in 1975, Ron Smith in 2005, Jacque Butler in 2008, and Brenda West Hagerman in 2017. Our small town roots hold down our costs but we have a multi-county reach into west Central Kansas. We typically interview new clients without charge. However, we do not give legal advice over the phone. We try to get the work out with the least delay.